When scientists talk about dinosaurs they mean a special kind of creature that lived on land during the Triassic, Jurassic, or Cretaceous period, many millions of years ago. A lot of people say "dinosaur" when they mean any prehistoric creature, such as sea creatures or pterodactyls. The only dinosaurs we can know about are the ones that leave fossil remains, but fossilisation is an extremely rare process. We have lots of fossil evidence for the late Jurassic and late Cretaceous dinosaurs, but long stretches of geologic time, across various continents, remain unaccounted for. It would be surprising, though, if palaeontologists (scientists who explore prehistoric times) discovered an entirely new and unclassifiable type of dinosaur, since most dinosaur families have been well sorted out. The name "dinosaur" dates back to 1842. The word has Greek origins: dino comes from the Greek 'deinos' which translates as terrible or powerful, and saur comes from the Greek 'sauros' which translates to lizard, and the name was selected by English palaeontologist Richard Owen. The most ferocious of dinosaurs was the Tyrannosaurus Rex. The bite of a T-Rex could easily crush through bone and was eight times more powerful than a lion’s bite! A Tyrannosaurus Rex had a lifespan of 25-28 years; the weight of an adult was approximately 7 tonnes or 15,430 lbs – that’s about the weight of 200 ten year old children! The longest dinosaur was the Amphicoelias. Based on fossils it is estimated that this Sauropod measured over 58 metres (190 ft) long. When dinosaur bones were first found hundreds of years ago by the Chinese, they thought they were the bones of giant dragons. It is believed that dinosaurs lived on Earth until around 65 million years ago when a mass extinction occurred. Scientists believe that the event leading to the extinction may have been a massive asteroid impact or huge volcanic activity. Events such as these could have blocked out sunlight and significantly changed the Earth’s ecology. There were survivors of this extinction; species of turtle, lizard, snake, bird and crocodile can all be traced back to the Mesozoic era; they have evolved to survive on our planet today. 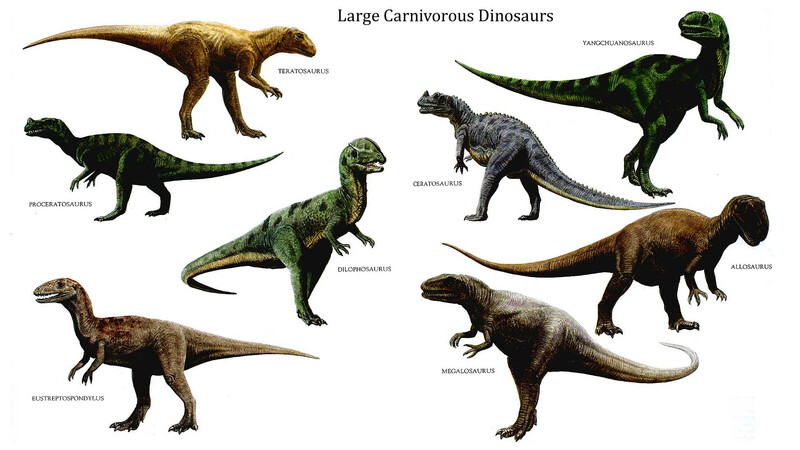 Dinosaurs came in all shapes and sizes, but some were the largest creatures ever to have walked the planet. For example, the heaviest and tallest dinosaur was Brachiosaurus at 80 tonnes. It was the equivalent to 17 African Elephants. Brachiosaurus was 16m tall and 26m long and is the largest dinosaur skeleton to be found in a museum. You might be forgiven for thinking that the T-Rex was the biggest carnivore, but it's now believed that Spinosaurus (which had a huge, crocodile-like mouth and a sail of skin jutting up from its back) was slightly heavier, weighing in at 7 or 8 tons. It's possible that this dinosaur's famous sail evolved as a way of increasing its skin area, and hence allowing it to cool down faster – yet more evidence that Spinosaurus was the king of the meat-eaters. The smallest fully-grown fossil dinosaur is the little bird-hipped plant-eater like Lesothosaurus, which was only the size of a chicken. Smaller fossilised examples have been found but these are of baby dinosaurs. The speediest dinosaurs were an ostrich-like species, such as Dromiceiomimus, which could probably run at speeds of up to 60 kilometres per hour. Some dinosaurs were extremely deadly. During the Cretaceous period, the dinosaurs of South America tended to be bigger and fiercer than their counterparts elsewhere on the globe. The Giganotosaurus, an eight-ton, three-fingered predator, was one of the biggest and most aggressive dinosaurs ever to walk the earth. Equally dangerous was the Kronosaurus. It was much bigger than a modern Great White Shark, and it had much bigger (and sharper) teeth. This huge pliosaur probably ate anything unlucky enough to swim across its path, ranging from fish to squids to other, smaller marine reptiles -- and perhaps even the occasional dinosaur that ventured too close to the water's edge. Dinosaurs didn’t have to be huge to be scary – Pulmonoscorpius was very similar to today’s scorpions but could grow up to one metre long and was armed with sharp claws and a venomous stinger. Of course, we don’t know how toxic its venom was, but considering the considerable amount it injected with each attack, it was most likely a very deadly creature indeed. A predator, it roamed the swampy forests of the Carboniferous in what is today Scotland. Reconstructions of what dinosaurs might have looked like in the wild! About three billion years ago the Earth was very different from the way it is today. The continents were not yet formed and the only living things were a few simple plants. Later, tiny boneless animals began to live in the sea. After millions of years these first animals developed into more complicated creatures with shells and skeletons. Eventually certain fish developed organs that meant they could leave the water and breathe on land. They were called amphibians. Some amphibians developed into huge reptiles called dinosaurs. In the Triassic period, between 248 and 206 million years ago, most of the dinosaurs were meat eaters and preyed on each other. The Jurassic period was next, 206-144 million years ago, when dinosaurs became the lead creatures on Earth. They survived and thrived because the Earth's environment was very perfect for them, there were lots of plants and lots to eat. The Cretaceous period lasted from 146 to 127 million years ago. One of the most recognisable dinosaurs, the Tyrannosaurus Rex, lived during this period. Dinosaurs were one of several kinds of prehistoric reptiles that lived during the Mesozoic Era, the "Age of Reptiles". The largest dinosaurs were over 100 feet (30m) long and up to 50 feet (15m) tall. The smallest dinosaurs were about the size of a chicken. Most dinosaurs were in between. It is very difficult to figure out how the dinosaurs sounded, how they behaved, how they mated, what colour they were, or even how to tell whether a fossil was male or female. The dinosaurs ruled the Earth for over 165 million years during the Mesozoic Era, but mysteriously became extinct 65 million years ago. Paleontologists study their fossil remains to learn about the amazing prehistoric world of dinosaurs. The dinosaurs became extinct during a time of high volcanic and land plate activity. There are a lot of theories why the extinction occurred. The most widely accepted theory is that an asteroid impact caused huge changes to the climate on Earth and the dinosaurs simply couldn’t adapt and died out. However, not all dinosaurs went extinct 65 million years ago. Turtles, lizards, snakes and crocodiles are all descended from dinosaurs. One group in particular survived, and we see their descendants every day. We call them birds. Paleontologists recognized this link over 125 years ago, and have been investigating it ever since. Discoveries have included shared skeletal features like hollow bones and hips that allow walking upright, and fossils of feathers and nesting grounds. New finds continue to fill in the bird family tree and shed light on ancient dinosaur behaviour. Maiasaurus meaning "good mother lizard"
There were more than 700 different types of dinosaur. They are often classified as either meat-eaters (carnivores) like Tyrannosaurus Rex, or plant-eaters (herbivores) like Triceratops. Dinosaurs all looked different. Some walked on two legs and others walked on four. 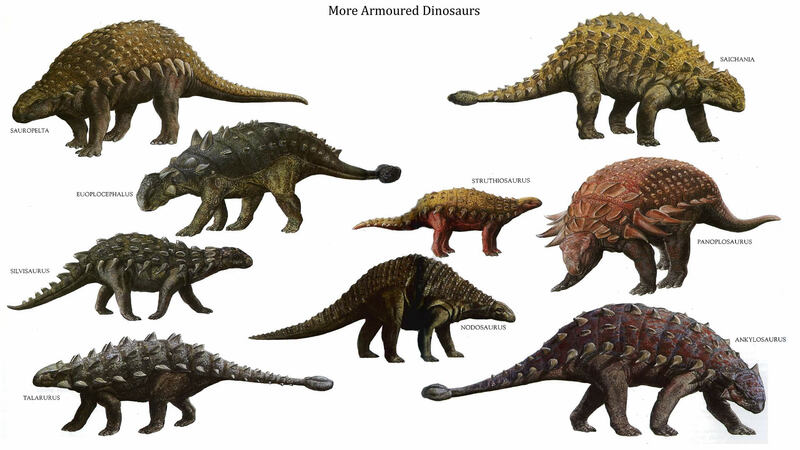 Some were very fast like Velociraptor but some were slow and lumbering, like Ankylosaurus. Some had horns and spikes, or bumpy skin. But no one actually knows what colour or pattern dinosaurs were. Asteroid - an irregularly shaped rock that orbits the Sun, occasionally falling to Earth. Carnivore - an animal that eats other animals. Continent - A continent is one of several very large landmasses on Earth. Herbivores - an animal that feeds only or mainly on grass and other plants. Pterodactyls - an extinct flying reptile with membranous wings and a tail and beak. Species - a group of living organisms consisting of similar individuals capable of exchanging genes or interbreeding. Unclassifiable - not able to be assigned to a particular class or category. Venomous - a poisonous fluid produced by an animal and injected into prey or attackers by a bite or sting. Make a dinosaur mask, learn to draw a dinosaur and more dino fun! Some dinosaurs had feathered tails! See a feathered dinosaur tail that was perfectly preserved in amber and is an incredible 99 million years old!